Last night it was my turn to host book club. I joined the book club last month, and as the newcomer I thought it would be a good idea to volunteer to host this month’s gathering. As the host I had the honor of selecting the book and I chose The Time Traveler’s Wife by Audrey Niffenegger. Although I procrastinated and didn’t start reading it until four days before book club, and may have rushed through some parts, I found it to be a very enjoyable read. If I had given myself more time to read it, I may have also been able to incorporate elements of the book into my party planning preperations. Yes, I was always the kid who got more excited about the book report art project than the actual book. Alas, any spare time I had on Wednesday night to decorate and create was consumed by finishing the book. The book had many inspiring themes and details to choose from: time, destiny, love, etc. 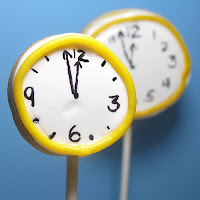 If I’d had more time perhaps I would have baked up some clock or hour glass cookies pops like these created by Meaghan Mountford of Chic Cookie Kits. 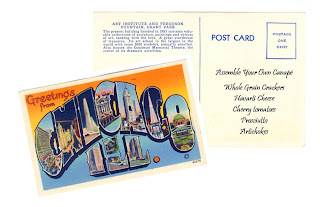 I think post cards inspired from different times and places in the book would have made excellent menu cards. I would prop them up with some sort of simple little card holders so that both sides could be seen. 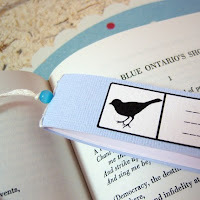 For favors (for the record, I do not think favors should be relegated to weddings and birthdays) I may have whipped or ordered up some of these wonderful bookmarks/mini journals and instead of an image on the cover, I would have used this quote from the book, “"There is only one page left to write on. I will fill it with words of only one syllable. I love. I have loved. I will love." Although none of these ideas came to fruition perhaps they'll inspire you to do a little something extra when planning for your next book club, wine club, play group, or Bunco night. I did manage to tidy up the house, cut and arrange some flowers, and enjoy a lovely evening with friends. I loved The Time Traveler's Wife and your ideas for book club! !